Carbonetic Clutch - Carbon Triple - Dezod Motorsports Inc - Home of the automotive performance enthusiast since 2002. The Carbonetic Triple Clutch is designed for extreme power as high as 1,500 HP. 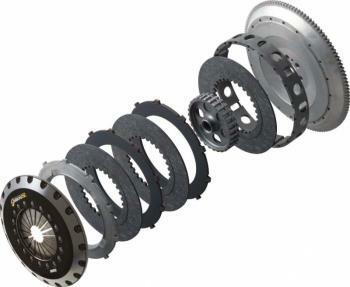 It’s half clutch operation is the ultimate in control, surpassing that of a Single or Twin Clutch. The inertia weight is kept to a minimum, thus enabling quick shifting. By installing our clutch with triple plates constructed of the non-mesh random waving method, the Carbonetic Triple Clutch is astonishingly strong and built to repeatedly handle the severest driving conditions. Carbonetic Triple Clutches include Cover, Pressure Plate, Carbon Disc, Flywheel and all necessary Bearings for complete install.